Russia has dismissed accusations by the top American commander in Europe that Moscow may be supplying Taliban jihadists in Afghanistan as they continue to fight against the U.S.-NATO-led coalition in the war-torn country. Echoing his counterpart in Afghanistan on Thursday, the top American commander in Europe, U.S. Gen. Curtis Scaparrotti, told American lawmakers that Russia’s influence in the war-ravaged country is growing, noting that the Kremlin may be providing assistance to the Taliban in Afghanistan. “I’ve seen the influence of Russia of late — increased influence in terms of association and perhaps even supply to the Taliban,” Gen. Scaparrotti, who also serves as the top commander of NATO forces in Europe, told the Senate Armed Services Committee Thursday. Despite openly admitting to Russia having a relationship with the Taliban, Zamir Kabulov, the Kremlin’s special envoy to Afghanistan, has dismissed the top U.S. general’s recent comments as false. “These claims are absolutely false… These fabrications are designed, as we have repeatedly underlined, to justify the failure of the US military and politicians in the Afghan campaign. There is no other explanation,” he told the state-run RIA Novosti Friday. In late 2015, Kabulov conceded Russia was exchanging information with the Taliban as means a to combat the Islamic State (ISIS/ISIL), saying Moscow’s interests against ISIS in Afghanistan “objectively coincide” with those of the Taliban. The envoy noted that Russia has also provided assistance to Afghan government forces. American Gen. John Nicholson, the chief commander of the U.S. and NATO forces in Afghanistan, suggested last December that besides Russia, its ally Iran and Pakistan are also aiding the Taliban. Gen. Nicholson was more direct when testifying before the Senate Armed Services Committee last month, telling lawmakers Russia was overtly trying to legitimize the Taliban terrorists using a false narrative that they were fighting ISIS. Moscow has justified collaborating with the Taliban by stressing that Russia is fighting a mutual enemy in Afghanistan — ISIS terrorists. 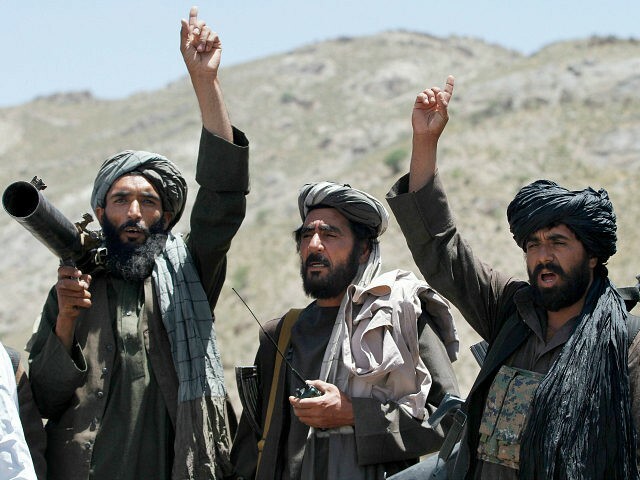 However, Reuters learned that the Taliban terrorist group has maintained “significant contacts” with Russia since at least 2008 before ISIS came into play. Despite more than 15 years of war between the U.S.-NATO-led coalition and terrorist groups in Afghanistan, many of them affiliated with the Taliban and its ally al-Qaeda, security conditions continue to deteriorate further in the country. The Taliban now controls seven districts and influences/contests six of the 14 districts in Helmand, the country’s top opium-producing region. Sangin, the last district in Helmand to fall to the Taliban provides the jihadists access to neighboring Kandahar, another opium-rich region along the Pakistan border. The illicit opium trade provides nearly 60 percent of the Taliban’s funding, Gen. Nicholson has estimated. Terrorists, primarily members of the Taliban and their ally al-Qaeda, killed more U.S. soldiers in the southern provinces of Helmand and Kandahar than anywhere else in the country. Gen. Nicholson has said the U.S.-backed Afghan troops and their enemies are in a “stalemate” and requested “a few thousand” more troops to train, advise, and assist the local forces.